Who said work isn’t fun?! In the last fortnight IBM’s Wimbledon in a Box tour has been in Scotland. To jazz things up a little we’ve created our own version of Pharrell’s “Happy”. It’s ridiculous and hilarious. Happy 25 Years Wimbledon and IBM! I always think that everyone like’s a birthday and then I’m reminded that there are one or two who would rather forget. It started when we became official supplier and consultant to The Championships in 1990, and since then together we’ve done cloud – before it was called cloud – and run the website which includes dealing with the fun that happens when the men’s final takes place on the Monday not the Sunday and everyone watches from their work desktop not the TV. The digital strategy for Wimbledon is “The next best thing to being here”, because despite about half a million people making it through the gates at SW19, nearly 20 million experience it through web, smart phones, tablets and so on. In a way it starts with data. And getting the data right. Of course, the umpire captures the score and drives the scoreboards, which provides some basic statistics. But IBM captures a far more detailed set of stats such as the direction of serve, speed of serve, return shot selection, number of strokes in the rally and the point ending stroke. You may have heard that IBM has the biggest mathematics department in the world outside of academia. Well, it seems we are creating our own tennis team too! We have 48 highly trained tennis analysts – county, national and international standard tennis players – who capture the data on the court side. And we have these people because with an audience of 1.2 billion around the world the quality of the data is absolutely vital and only these tennis players really know what type of shot has just been played and whether an error is forced or not. .
We take data from almost every kind of input data source available such as sensors, counters, video, images, and text. We also ingest data from social media of all kinds. And then we do some – lots – of analysis and spit it back out again in ways that are easy for consumers to digest. 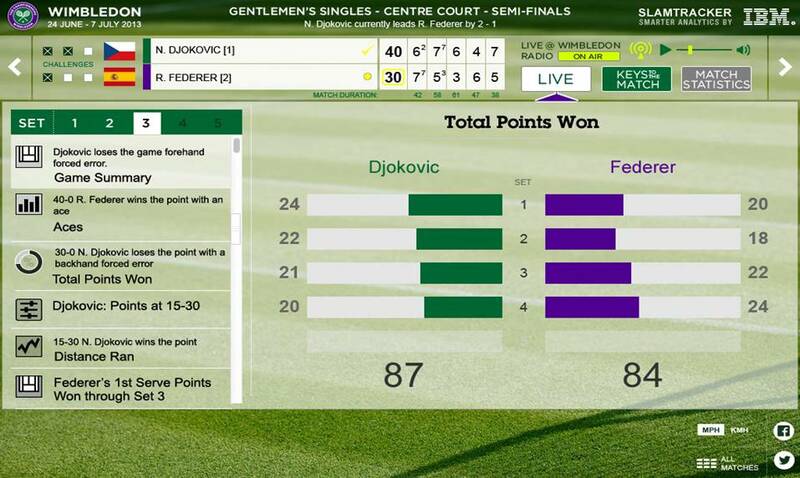 So, the data gets sent to the Wimbledon Information System and to the BBC for all the presenters (did you really think they had done all the research themselves 😉 ), to the BBC for the graphics on TV, to the players so they can understand their performance and areas for improvement, and to SlamTracker to make us feel like we are the tennis coaches. The bit I get most excited about is what we do with the social data that’s available. This year the Wimbledon Social Command Centre has been launched. It provides real time insights into social media trends, allowing the Wimbledon digital team to tailor their content according to what fans are interested in. This is all to provide a more engaging experience. It has cutting edge social media network node analysis to understand who the key influencers are. This looks at activity versus engagement, dependency, authority, timeliness and followers. And it has practical application, it’s not just a nice to know: on one occasion in 2013 the queue was too long and the All England club wanted to advise people who didn’t already have tickets not to come to Wimbledon that day. Using influencer analysis, the club could discover who had the highest timeliness rating and also strong network authority and could then target those people with communications to get the message out rapidly to the highest number of people. I’ve already taken part in the Social Hill called Hill v World. The idea is to improve fan engagement on and off-site. Questions are posed and responses available via Large Screen TV and all digital platforms, including in the Social Command Centre. Again, this is in support of the next best thing to being there. You see, social media volumes are increasing exponentially, with a 100% increase in twitter traffic about Wimbledon from 2012 to 2013. It will be fascinating to see how that increases again this year. So, social media has to be a fundamental part of the digital strategy. Wimbledon has 1.5 million facebook likes, 90K instagram followers, 800K twitter followers and 75K youtube subscribers. That’s potentially a lot of thoughts, opinion and experiences that can be tapped. There’s a lot more we do with Wimbledon too. It takes us 3.5 minutes to provision additional infrastructure when needed, we use Watson to improve the accuracy of those provisioning requirements, and we keep it secure using our Security Intelligence Platform. There’s a phrase being used a lot these days which I quite like. It’s “Not your father’s IBM”. Please don’t misunderstand me. We have done a lot of groundbreaking stuff over the last 100 years (see earlier video), all with a lot of relevance. However so many people still think of us as a hardware business and that we make PCs, and even that we’re old fashioned. But we sold that PC business back in 2004 and we continue to be relevant and applicable. Our social enterprise software has been named as the global leader 5 years in a row. IBM Interactive Experience is our global digital agency and we’ve recently invested yet more in it – $100M I believe. In the UK we were announced as number 2 in the Econsultancy UK Top 100 Digital Agencies. Wimbledon is a great example of that. Did you know we did so much for them?